A rare pattern. This bowl brought $750 at the 2003 Heart of America Carnival Glass Association convention auction. 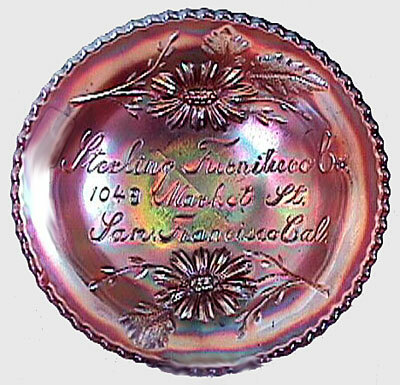 The lettering reads “Sterling Furnitured Co, 1043 Market St., San Frandisco Cal.” Like many other lettered pieces, Sterling Furniture pieces were made using Fenton's Garden Mums as the basis for the pattern.